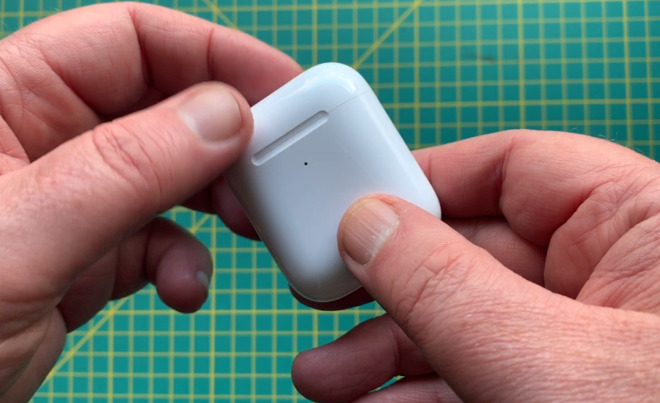 Apple's updated AirPods are now arriving in people's hands, and they bring wireless charging —if you pay extra for it —as well as improved sound and hands-free "Hey, Siri." You do have to actually use a pair of AirPods to understand why people love them so much. The original AirPods were surely the closest Apple product to genuinely being 'magical' and they made you feel as if your life were surrounded by music. That sensation hasn't disappeared in the slightest with the new version, you do not ever get inured to how brilliant AirPods are. And if it weren't for one thing, Apple's greatest competitor for the newly updated AirPods would be the original AirPods. That one thing, though, is that if the magic hasn't faded, the battery life has. We found that a pair of original AirPods bought in late 2016 now holds a charge for around two hours of continuous playing compared to the five or more they originally had. It feels wrong, just very wrong, to replace a $159 pair of headphones after at most two and a half years. Yet if you can do it, if you can buy yourself a pair of the new AirPods 2, then do, and you won't be sorry. If nothing else, a new pair of AirPods 2 will return you to that gorgeous state where you simply never think about where the music is coming from. It's a little sobering to suspect we might want to replace these AirPods 2 in, say, 2022, but fortunately Apple has found enough improvements to excuse us buying more pairs. None of the improvements to the AirPods read as if they make them a compelling purchase, but once you have them, they are precisely why you can tell yourself it was a good buy. Just as with the original AirPods, hearing and wearing is believing. AirPods now come in two versions, $159 and $199, which are really the same AirPods but with a different charging case. This is the protective carrying case you get and which is also how you charge the AirPods. With either version, you can plug a Lightning cable into the case and charge both it and the AirPods up. For the $199 version, though, you can also just rest the case on a Qi charging mat and it will be recharged. The only visible way to distinguish between the two different cases is that the wireless charging one has a pinprick-sized status light on one side. It's usually off, but turns orange when you place it on a charging mat and green when it's charged. This replaces the similar light that is on the inside of the original charging case. It should be noted that the light does not illuminate while AirPods are charging via Lightning cable unless the lid is opened. We are unsure as to why Apple decided to implement this method of indication, but it might prove an annoyance for those who want to check device charge at a glance. If you really wanted to hang on to your old AirPods, you could buy this wireless case by itself for $79. That's a lot less than either $159 or $199, but it's unlikely to be worth it unless you have only recently bought the AirPods and you truly must have wireless charging. The cost of replacing your original AirPods battery —really the cost of replacing the AirPods themselves —makes it uneconomic. Then there's the addition of hands-free "Hey, Siri." Previously, on the original AirPods, you used to have to configure an AirPod so that you could double-tap it to summon Siri. Considering that this took seconds and then it was pretty effortless to call Siri that way, this can't feel like a headline feature. Whereas the mark of any headphone, the real headline, make-or-break feature, has to be the audio quality. You can tell us that there are better headphones in the world and we would believe you. However, we wouldn't buy them. Where we were happy with the sound quality on the original AirPods, the new AirPods 2 are unquestionably better. Just how much better is harder to precisely define. 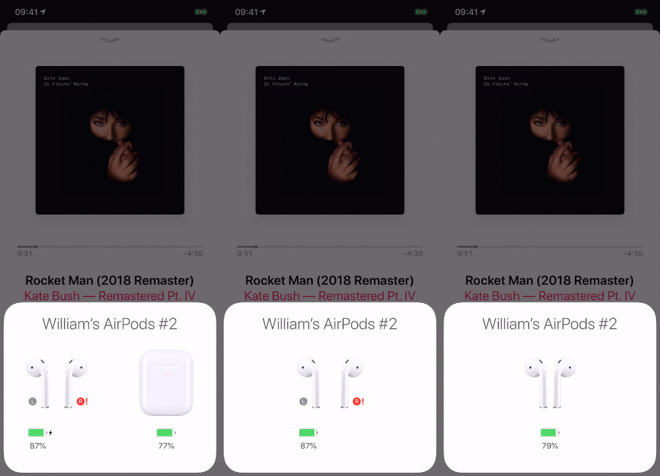 On "Rocket Man (2018 remaster)" by Kate Bush that we looped for testing, AirPods 2 let us clearly hear what sounds like the sort of breathy fault you get with vinyl, and which just isn't there with the original AirPods. AirPods 2 are certainly louder, but it also somehow feels as if these new headphones are working harder. They're bringing us closer to the artist's intention. The sound is fuller, perhaps brighter. You do need to have the latest version of iOS installed on your iPhone before you can use the new AirPods to their fullest. Other than that, though, configuring your new AirPods 2 to work with your phone is as preposterously easy as it was with the original model. Just open the case near your iPhone and you are prompted through adding them to that phone. Even that is overstating what you have to do as it's really just that you're agreeing to let the iPhone connect. Thereafter, just take them out of the case and put them in your ears. If you even notice your iPhone screen, it will be showing you the battery charge on the two AirPods and their case for a moment. The AirPods will be named as yours, based on the name of your iPhone, with one exception. 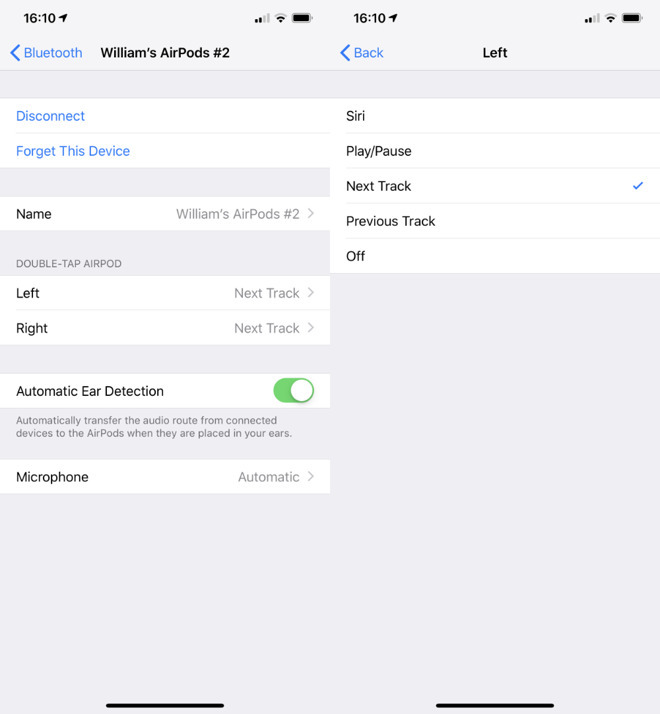 If you already have the original AirPods paired, then the new ones will appear as, for example, "William's AirPods #2". You can, and we did, swap back and forth between the original and the new AirPods 2 simply by changing which ones we put in our ears. Or at least we did until the battery on the original ones died. We admit, we turned the volume up far too high on that track with the vinyl-like faults. However, even as it was hurting our ears, we were able to casually say "Hey, Siri, play our Favorites playlist." It took a moment to register that we'd spoken, and then the volume of the current track mercifully dipped a little to let Siri chat back to us. Then our Favorites playlist from Apple Music was in our ears. Equally, we were then able to say, "Hey, Siri, set the volume to 50 percent," and get some respite. There are times when Siri seems quieter or louder than others, such as when it has to say, "One moment" before recognizing our command. It's not uncomfortably different, it's just sometimes noticeable. Overall, Siri is unexpectedly excellent. Seriously, if you shrugged at that feature, you won't once you've got it. Not only did it suddenly seem like a chore to call up Siri with the old double-tap, we actually forgot how to do it. 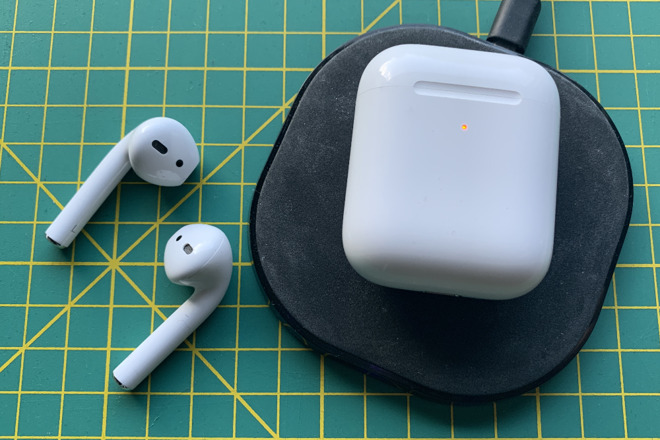 To compare the audio quality, we've been swapping back and forth between the original AirPods and the new ones. And you should see us frozen on the spot, trying to recall which AirPod we had to tap and whether it was once or twice. This wasn't after protracted use of AirPods 2, it was immediate. This is Apple doing that thing it does of making something somehow right. The way that once they've done it, you can't imagine why it was ever any different. If you prefer the old method, you can still set that up in Settings, Bluetooth by tapping on the i button next to the AirPods' name. This is precisely as it used to be —you still get the same choices of having a double-tap mean Siri, Play/Pause, Next Track, Previous Track or Off. It would be good to have some more options, perhaps to do with handling phone calls such as bouncing them direct to voice mail. As it is, the addition of hands-free "Hey, Siri," means we're unlikely to set up any double-taps at all. We did have times when we'd complete dictating a long text message only to have Siri tell us the name of the track we were playing. Then we might've preferred tapping twice so that we knew we were being listened to. There are no new options for what double-tapping an AirPod can do for you. And this new hands-free feature also means that we don't have to be told when Siri is ready so the familiar bleeps are gone. That's good at the start of a command but as there's no ending bleep, we're still left wondering whether it's worked or not. It's only ever for a moment, as Siri will then respond, but it's taking us a while to get used to. The sole actual problem with "Hey, Siri," apart from how it gets tedious repeating those words over and over, is how this means pretty much all our devices are listening out for it. Apple's devices are remarkably clever in how they poll each other to calculate whether you were most likely speaking to your AirPods 2, your Apple Watch or whatever. Nonetheless, it does go wrong, so we have had the AirPods and a nearby HomePod simultaneously shuffle different tracks. This is something that has changed since AirPods first came out. We now have HomePod, too. Both fill the air with music, both are able to take phone calls and both have Siri. The difference is that HomePod feels like it fills your room while AirPods fill your head. Both will help you enjoy music, but AirPods 2 make you live for it. Just don't talk to us about having to replace these AirPods in two to three years. Get back to us in 2022, we'll be ready to listen then. That's especially if Apple's added new excuses, we mean, health features to justify buying them again. In short, if you have AirPods and have bought them recently, you'll be tempted, so tempted to get a new pair —but you can hold off until it's time for service, and battery life is short. But, if your batteries are getting flat, and runtime is getting low, don't wait to buy. Apple authorized reseller Adorama is discounting brand-new AirPods by $10 with coupon code APINSIDER when used with this pricing link. For the latest deals and product availability, including discounts on last-gen AirPods, be sure to check out our AirPods Price Guide, updated throughout the day. *Price with coupon code APINSIDER. Need help with the coupon? Send us a note at [email protected] and we will do our best to assist.